Scanning probe microscopy (SPM) is a unique tool – providing unprecedented spatial resolution down to a single atom, including its manipulation. The tool has had an immense impact on progress made in fields such as surface science, nanotechnology and surface reactions. However, the resolution of individual molecules was previously very limited, mostly showing featureless objects that prevented insight into their chemical structure. This deficiency severely limited the study of molecules on the surface. 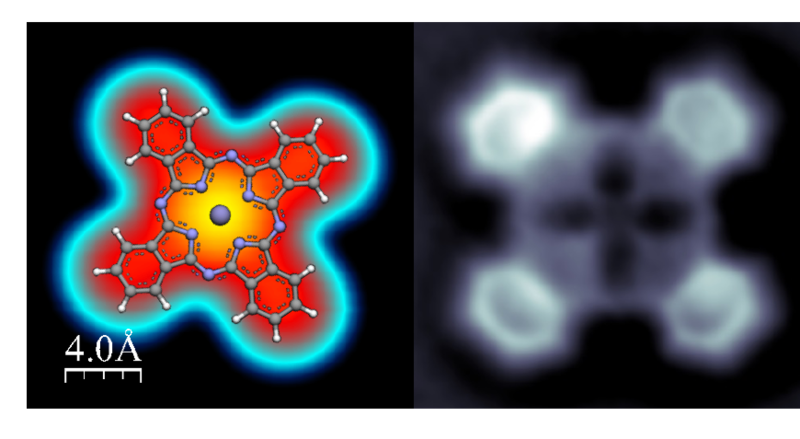 However, the situation has changed dramatically over the last few years, as so-called “high-resolution imaging with functionalised tips” was introduced, where the chemical structure of individual molecules can be revealed directly from experimental images. The key here is a proper functionalisation of tip apex with a single molecule or atom, the lateral flexibility of which gives rise to unprecedented spatial resolution. Comparison of a standard STM (left) and high-resolution AFM (right) image of Iron(II) phthalocyanine molecule on gold surface. With such tips, for example, individual benzene rings forming organic molecules can be visualized directly by microscope. Not only that, but now the electrostatic potential of molecules, bond order or radicals can also be observed. Chemical structure of reactants, intermediates and final products of chemical reactions on surfaces can now be identified, which for a long time was a dream of not only chemists, but of scientists of many other fields too. This opens new perspectives in advanced characterization of physical and chemical processes and properties of molecular structures on surfaces. Evidence of that is enormous progress in the field of on-surface chemistry. Despite its youth, the technique has already brought many new possibilities to perform different kinds of measurements which cannot be accomplished by other techniques. In view of its enormous progress and large potential, we can say that this is one of the most remarkable and exciting achievements in the ﬁeld of SPM in the last few years. In this review article, the history and recent progress of high resolution imaging with a functionalized probe – by means of atomic force microscopy (AFM), scanning tunnelling microscopy (STM) and inelastic electron tunneling spectroscopy (IETS) – is described. Mechanisms responsible for the high-resolution AFM, STM and IETS-STM contrast are discussed. The complexity of this technique requires new theoretical approaches, where a relaxation of the functionalized probe is considered. This led to a new theoretical approach, which enables not only an efficient simulation of the high resolution AFM, STM and IETS-STM techniques, but also a deep understanding of the underlying mechanism. The review also contains a concise summary of the signiﬁcant achievements and progress in different branches of science stimulated by high-resolution SPM imaging, and details some of the remaining challenges which must be overcome to further reﬁne these high-resolution methods. Pavel Jelinek has been working on several projects related to both theoretical and experimental aspects of high-resolution scanning probe images of molecules on surfaces. His scientific achievements were recognized by several national scientific awards. He is head of Nanosurf Lab in the Institute of Physics of Czech Academy of Sciences and associate professor at Palacky University Olomouc. Nanosurf Lab combines experimental and theoretical expertise, which allows for a detailed understanding of the underlying chemical and physical processes on surfaces at the atomic scale. Among others, the team pioneered a new theoretical description of the mechanism of high-resolution imaging with functionalized tips. Employing the high-resolution SPM technique, they developed a novel technique mapping electrostatic potential of molecules with sub molecular resolution, and demonstrated controlled chiral transfer of molecules during their chemical transformations on surfaces.